Scrap: On Louise Nevelson was released by Ravenna Press in March 2018 as part of their Pocket Book Series. These linked prose poems are based on the art and life of this important American sculptor. Sections have appeared in Blackbox Manifold, Ekphrasis, and 22 Magazine. The project received an honorable mention in the Tupelo Press July Open Reading 2015. 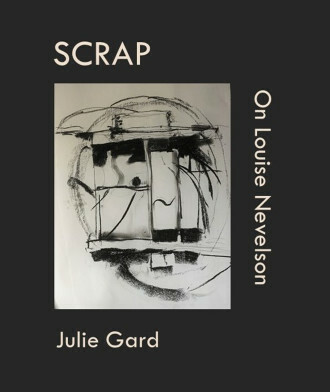 "In Scrap, Julie Gard carries out a necessary expansion of the ekphrastic tradition, not only entering into Louise Nevelson's artworks with the precise, feelingful, and articulate response of an ideal viewer but also taking on the more emotionally fraught question of what it means to be an artist and a mother, both for Nevelson and herself. It should surprise no one who has taken on both roles that there are no easy answers, that the possibility of betrayal of either dedication is always present. Scrap voices all of these concerns with clarity and with an original thinking-through that makes the book a pleasure to read." "Just as Louise Nevelson organized the chaos of found objects--bowling pins, winged griffins, tennis rackets, and wooden wheels--into mini-worlds contained in uniform boxes, Julie Gard's spare yet expansive prose poems frame one major question. How can a woman be both an artist (or writer) and a mother? Children and art, Gard writes, demand the same force and breath. Scrap explores two possible, nuanced answers. In Gard's vision of Nevelson's kitchen, the artist created dark realizations and potions of grass and rust and horns --never food or warmth--and sent her young son away for years. Yet Gard, in considering Nevelson's art and life, constructs another way: between and despite daily interruptions and worry, forgotten swimsuits and repacked suitcases, she both cares for her daughter and writes deeply resonant prose poems, elegant in their clarity. I am so glad she did."